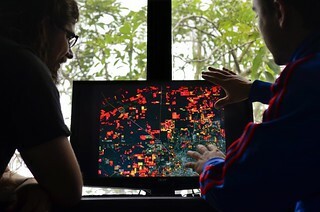 The recent launch of Terra-i, a near real-time deforestation monitoring system for Latin America, brings the hotspots of forest loss into sharp focus. Based on satellite information from NASA, Terra-i can zoom-in on the region’s forests to a resolution of 250m x 250m. It’s smart enough to distinguish between natural losses and those caused by human activity – and can also monitor habitat change in non-forested areas, such as savannahs and deserts. Anyone can log in and watch what’s happening – from anywhere in the world – and with images updated every 16 days, little escapes the all-seeing Terra-i. Developed by CIAT, The Nature Conservancy, King’s College London and the University of Applied Sciences and Arts Western Switzerland, Terra-i is aimed at helping governments and decision makers in Latin America formulate new policies on forest and habitat protection – and test the effectiveness of existing ones. With agriculture a major driver of deforestation in the region, Terra-i can also help identify high-priority areas for the implementation of REDD+ schemes, which aim to reduce carbon dioxide emissions from deforestation and forest degradation by engaging local communities to protect the forests. While Brazil has had its own hi-tech deforestation monitoring system in place since 2008, Terra-i is the first to cover Latin America as a whole, from Mexico to Argentina. Already it has enabled scientists to focus on areas that often slip under the deforestation radar, for example, the Gran Chaco – a highland, dry forest spreading across Paraguay, Argentina, Bolivia and parts of southern Brazil. The second-most densely forested area in Latin America after the Amazon, it’s a biodiversity hotspot and a living museum of pre-human plants, but its plight has been overshadowed by international focus on its neighbour, the Amazon itself. Launch in mid-2012, Terra-i revealed that around 1 million hectares of forest had been lost in the Gran Chaco between 2004-2010, driven by the expansion of soy plantations, together with the displacement of cattle ranchers into the region by industrial agriculture at the perimeter. “The rates of deforestation in The Chaco were a huge surprise to us,” explained Terra-i team leader and CIAT researcher Louis Reymondin. ”There’s so much focus on the Amazon – and rightly so – but what we witnessed in The Chaco was much more severe than anywhere in the Amazon. Open source and free-of-charge, Terra-i means lower-income countries in Latin America now have the chance to monitor deforestation themselves. At the end of 2012 the Terra-i team trained technicians from the Bolivian government on how to use the system. In 2013 the team hopes to rally support to develop the system for other parts of the world, helping monitor deforestation high-risk areas in Borneo and the Democratic Republic of Congo.